We wear many hats, so you can make fewer phone calls to meet your needs. Click on a link to the left to find out more about the many services we offer, and contact us to get your project started today. Multi Hat Media has a team of experts that know how to get your site top rankings in search engines such as Google, Yahoo, and MSN. Contact us today to find out how we can help you reach your traffic goals. 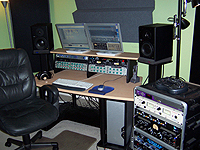 We also have a full-fledged pro recording studio which allows for a one-stop shop experience. Record and edit audio, have a photo shoot, and get it all up on your website with just one call to Multi Hat Media.